In the exhibition “Carboniferous memories,” Swedish artists Helena Johard and Jakob Anckarsvärd examine crude oil through their individual artistic processes. The exhibition aims to shift oil from its industrial meaning to represent both nature’s uncontrolled forces and our minds’ intrinsic, subconscious activity. As our everyday experience is influenced by our irrational nightly dreams, the fossil memory of crude oil echoes in our rational world by smelly, smeary, extinct life forms. For Art on Armitage, Anckarsvärd and Johard use paintings, installations and video to create a window shopping experience that offers alternative readings of oil, but could also represent our uncontrolled inner life. Johard and Anckarsvärd have had a close artistic exchange since studying at Glasgow School of Art and they have had several exhibitions together. Anckarsvärd and Johard share an interest in human symbolic reality and it’s power to create new meaning. 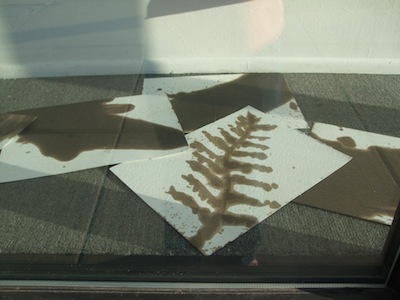 They often work site specific, where ideas often emerge by the interaction with the environment. On May 31, Helena Johard performed “Invertebrate,” on the sidewalk in front of the gallery, lying immobilized for one hour under a pile of soil in reference to lifeforms that were compressed to create today’s oil, 358 million years ago. Her Rorschach images were created using crude oil spill debris picked up on the shore of Sweden. Ankarsvärd’sdrawings were created from crude oil.